Although it is literally incorrect to say “everyone has a smartphone”, the fact of the matter is that it seems like everyone has one of the multipurpose devices. While it is certainly not true that everyone has a tablet, a majority of American adults do own the very mobile computer. Among defined contribution plan participants, mobile technology ownership is pervasive. The question is whether those DC participants use those modern mobile technology devices for the purposes of attending to their own investments and their DC plan accounts. Spectrem’s new report on defined contribution plan participants, Using Social Media and Mobile Technology in Financial Decisions, examines the way plan participants use their devices in accessing and updating their financial accounts. It also looks at how participants use those devices to find out financial information. If you are interested in learning more, take advantage of an exclusive opportunity to preview the defined contribution report by CLICKING HERE. Additionally, you can CLICK HERE to purchase the report. Despite the fact the death of the personal computer has been predicted for years, investors of all types use their PC or Mac for financial research for more than they use smartphones or tablets. Ease of use or comfort level is probably responsible for that situation. However, among the 89 percent of plan participants with a smartphone (including 99 percent of those under the age of 35) and the 69 percent that own a tablet, financial research is taking place on those devices. Plan participants use their mobile devices to access their personal financial information regularly. Eighty-six percent access that information at least monthly. 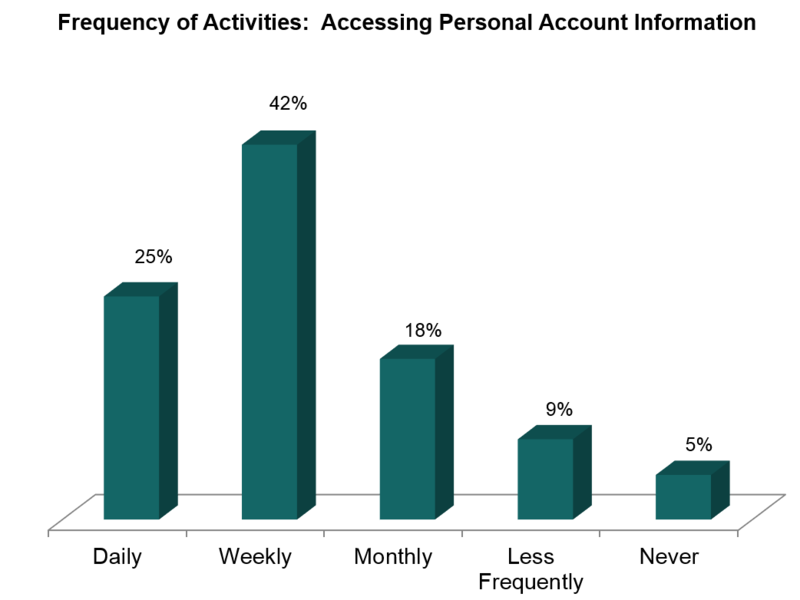 Twenty-one percent of plan participants do financial research on a monthly basis, while 15 percent do so weekly and even 7 percent do so daily. However, only 18 percent of plan participant trade online monthly or more frequently. What plan participants do use their mobile devices for is to read financial blogs. Asked to place their likelihood of reading financial blogs on a 100-point scale, plan participants placed their interest in blogs on the websites of financial media outlets at 59.55, the highest score on the scale. Similar scores are posted for “websites from my financial provider” (58.97) and “other financial websites” (57.19). Interest in blogs on LinkedIn is far less (39.63). Twenty percent of plan participants regularly read blogs on financial topics, while 27 percent said they do or would read blogs presented by trusted financial providers or advisors. If there is a divide between plan participants and their mobile technology usage, it is in the choice between accessing a website or using an app designed by the website for specific information. While 33 percent express no preference, 37 percent prefer the website browsers and 30 percent prefer to use apps. Those percentage may change as plan participants become more accustomed to the use of apps and financial providers increase their development of apps. Website users like to have access to the entire website, and 12 percent of plan participants say they don’t like to download apps. Almost one quarter report website browsing is easier to navigate than apps. Of the app users, however, 75 percent said information is easier to access on an app because it is often presented immediately, rather than requiring any digging by the user. After downloading, apps can also be accessed without the need of an internet connection.